My ASUS Eee PC is over a month old. This means it’s ready to be reviewed by yours truly. As usual, let’s first look at the stats…And, for those interested in getting this netbook, Amazon prices are listed below (they have great deals on netbooks generally). What this does not tell you, is that the RAM included is actually DDR2 800, which steps down to 667 and so forth (more on that in another article). I’ll be writing a series of netbook articles so watch out for those. Expect some guides. Physically, this netbook looks beautiful. It’s like a laptop had a big baby and this was the result. Fortunately, it isn’t THAT small (do not think that this netbook is big though, it’s very portable!). I say fortunately because this means the keyboard is pretty big (92% of a full sized keyboard and it’s ergonomic). Something to note about the keyboard…There are no “home”, “end”, “Page Up”, and “Page Down” keys. I used these keys all the time so this is very disheartening. Instead, you must use FN+arrow keys to perform these key’s functions. It lowers my productivity a bit. The keyboard also has enlargened “Left” and “Right” arrow keys. This sounds cool, but is annoying because the “Up” and “Down” keys are small. Majority of the world uses the “Up” and “Down” keys much more often than “Left” and “Right” (like when scrolling through pages, PDFs, etc)…But oh well. At least it’s easier to go left and right when you’re writing stuff. The netbook not being too small also means that the screen isn’t too small. It is 10.1″ diagonally — and looks greats. The tradeoff for a good-looking screen: it does not do well in the sun. Expect glare (unless you purchase an anti-glare covering). Some netbooks have larger screens than this, and I do believe that this specific EeePC could have reached 11″ as there happens to be more than enough left over space, but 10.1″ is more than adequate. The keys on the keyboard feel nice. They make a happy click when tapped, opposed to an overly loud “CLICK!!! !” that some keyboards make. How about the mouse pad? It’s easy to use and is covered with dimples. It is a perfect size too for me, but my hands aren’t overly huge. The mouse keys, however, don’t click too easily and when you do you hit them, they can be a tad bit loud depending on what part of the mouse keys you click. Not a problem really. I find myself just double-tapping the mousepad instead for 100% silent clicking (good for Russian spies!). One thing that you’ll notice immediately is that this EeePC is a fingerprint magnet (this part is NOT good for Russian spies). Your local authorities will probably stop using ink to get a copy of your fingerprint. They’ll start using these badboys instead! So…you can either keep trying to clean this little netbook or you can take care of the problem by buying a skin. These can make the netbook look awesome, as well as cover majority of the surface area where fingerprints collect. Just be careful to eliminate all air bubbles when applying the skin. You could just ignore the fingerprint issue altogether, but you will never make your dream of becoming a spy come true then. Okay, enough spy talk. I haven’t used the webcam yet, but this particular model has a 1.3 megapixel webcam/camera. I’ll likely not use it often, but it’s good to know that it’s there in case I want to show my cleavage on the internet (completely joking here!…I think). I’ll be sure to update this review with an example picture or video using the webcam when time allows me. I’ve heard that people have had issues with the mic on this netbook, but we’ll see how it fairs for me soon enough during a test video. Regardless, I’m sure it’s good for spies. Yeah, yeah, I said I wouldn’t continue spy talk. I lied! One of the selling points of this netbook is the compatibility that it has with access points. It supports not only the usual 802.11b and 802.11g, but also 802.11n. This is great news to many and will allow you to utilize more modern wireless technology. Good job ASUS! I find that the wireless detection is generally pretty good. It detects a lot of signals, but of course doesn’t have the same type of power that my cantenna or parabolic antenna have (they’re external, this is internal). The battery life is amazing. It’s rated for 10.5 hours, but you’ll average less of course. 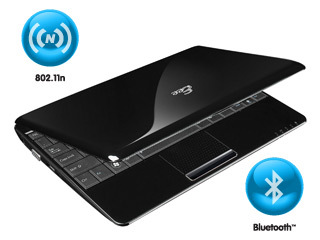 This netbook comes with Asus’s Super Hybrid Engine — which conserves battery life by controlling the performance of the computer. 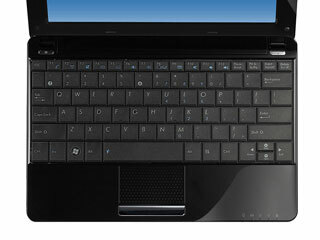 In auto mode, it will lower and increase the netbooks performance as needed in order to conserve battery life. I haven’t actually timed it or anything, but with WiFi enabled, bluetooth disabled, power saving mode enabled (via Super Hybrid Engine), and a high brightness, you can expect at least 7 hours of life. There is one problem though. The transformer portion of the charging cable can get hot. There is an easy way to keep it relatively cool though — and it requires no tools. Do NOT place the brick flat down on anything. Try to have it sit diagonally so that only 20% or so of the surface area is actually touching the ground and 80% or so is in the air. Doing so, for me at least, keeps the power block/transformer piece completely cool. Awesome! I was VERY happy that this came with a standard hard drive instead. This provides more space than I’ll ever need — a whopping 160GB of space. A solid state drive would have made this bad boy even faster, but you would lose out on all the extra space, not to mention the computer would cost more (depending on the solid state drive). If you DO wish to install a solid state drive, it isn’t difficult. A SSD will actually increase your battery life too, as well as the speed of the computer. If you choose to install a small SSD, this EEEPC comes with a SD card reader built-in so you can always store data on a couple of SD cards. One problem with that, however, is that the SD card reader will increase battery consumption when in-use. 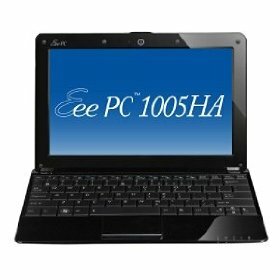 This EEEPC also comes with 10GB of online storage space that I’ll never, ever use. I’d say something like “but it’s good to know it’s there” — but even then I just really don’t care about its existence. As mentioned earlier, this uses DDR2 800. It comes with 1GB of ram with only one ram slot available, but supports 2GB’s total. What does this mean to you? If you upgrade, you will have an extra 1GB of ram on your hands. Obviously it would have been nice for 4GB support with 2 module slots, but that’s just me being greedy. This is a netbook after all. The next generation will have 4GB support as well as the aforementioned 2 RAM module slots. So…how does 1 GB of RAM run on this? Perfectly! I actually found little reason to upgrade this, except for the fact that I use some high end software that makes use of it. With 2GB of RAM, Everything, including Adobe Photoshop/Flash CS4, ran with ease. Neato! If you choose to stick with 1GB of RAM though, you should increase your virtual memory. Installing new RAM, if you end up doing so, is VERY easy. It takes almost no time whatsoever because of the crafy design used by Asus. You simply remove the plate covering on the bottom of the netbook and then remove the clips from the RAM module, making sure to make note of how the RAM module was positioned so that you can easily replace it with the new RAM. After putting the RAM in simply screw on the plate covering and you’re done! This uses an Atom n280 processor, which is rated at 1.66ghz. Its predecessor, the n270, is rated at 1.6ghz. This processor, though not a monster of a processor, actually supports computing pretty well. It is great for battery life. Expect processor changes in the next wave of netbooks though. Other than the terrible power supply issues, the build quality is great. The hinges connecting the screen are very strong. I’ve seen many notebooks develop hinge problems too so having good hinges is comforting. The overall shell of this netbook is strong. They keyboard feels like it could take a bit of abuse too. Also, unfortunately…this netbook has fallen while open off of my bed. The fall was only 3 feet or so, but it was perfectly fine. The computer was also on at that time and it didn’t freeze. It has taken a couple of falls from a height of 2 feet as well and remained fine. Coolio to that! I have yet to punch this netbook in a fit of frustration, but if I do, I’ll tell you guys how it holds up. I imagine it’ll be fine. This netbook has 3 USB ports — 2 on one side and 1 on the other. Very nice! It also has FN keys (as indirectly mentioned earlier) — the usual ones found on notebooks (such as brightness increase/decrease, increase/decrease audio, etc). Audio on this netbook is also pretty good. It not only sounds good, but it gets more than loud enough when set to. ASUS has released many BIOS updates and includes an easy-to-use BIOS updating utility that allows you to flash your BIOS while on Windows (requiring a restart at least). These help increase battery life (or so says ASUS), as well as help out with miscellaneous things (refer to ASUS’s website for a changelog). Also, this comes with a partitioned hard drive. 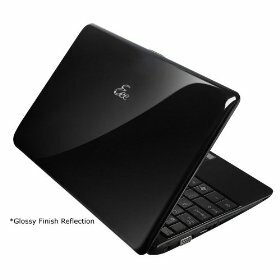 It has the main partition with the OS, as well as a secondary partition to store files on. The reason it’s setup this way is because there is an automated recovery service that will clear the first hard drive if necessary. This Eee PC has a built-in install for Windows XP. There are also several other partitions, but they’re not visible to the user — and you won’t need to touch them unless you plan on making additional partitions for Linux or other operating systems. You may want to buy a USB DVD drive if you wish to watch/listen/burn movies/music or install applications from CD’s/DVD’s. You can grab the install files from CD’s and force them to run from a USB too, but not everyone knows how to do that. You may want a flash drive/thumb drive for quick transfering of files between computers. This can be done through the 10GB online storage or through network transfers as well, but I find a flash drive to be much less annoying to use. This comes with bluetooth so you might want a bluetooth mouse. Alternatively, you could also use a portable USB mouse too. Bluetooth also gives you the option of using a bluetooth keyboard (if you really need to) and a bluetooth headset/headphones. You WILL have lower battery life if you use the bluetooth though. I don’t recommend it since many alternatives exist. An anti-glare screen covering to prevent glare from sunlight. A netbook skin to help deal with the hideous fingerprints and scratches. I forgot to mention that this netbook came with software that allows users to use specific motions when using their mousepad to cause certain events to trigger — such as back and forward. While this does sound cool, I found it to be a pain and had to disable it almost instantly. It has a shelf life of 5 minutes or so with me until I turned it off, which is why I forgot to mention it in this article 🙂 Of course, it may be easier for some of you to use, but for me…no. I kept accidentally triggering the mousepad motion events. Another mention is that ASUS has been pumping out BIOS releases again. This is, of course, a good thing since each release brings an improvement or bug fix of some sort. And so…My review comes to an end. If you have any questions at all, then comment and I will respond the same day most likely. I will also edit this review with any problems that I encounter and so forth. I thought it would be interesting to mention some of the gaming capabilities of this netbook, as well as the lack thereof. It will play a lot of older games, but you may encounter issues with resolution. For example, it plays Rise of Nations Gold Edition almost runs perfectly. This is where that resolution problem kicks in. It’s hard to explain, but you have to scroll through your screen because the entire screen doesn’t fit at once. This is done automatically with the cursor of course, as if there were imaginary auto scroll bars. The game is still playable, but it’s definitely harder to do so…At least there’s no lag, right? Some other games that work well: Peggle, Diablo II, and Starcraft. Though old, these games are still indeed fun. Some of them are very capable of being tweaked to solve resolution issues so if you encounter them, then I suggest doing some quick Googling before dismissing the game. If there’s any interest, I’ll write an article on overclocking this computer as well, though it really isn’t necessary. The n280 doesn’t overclock as well as the n270, but it can budge a bit. So can other aspects of this netbook. So I decided to take the plunge to see whether or not the Asus Eee PC 1005HA-P Netbook was capable of playing World of Warcraft (WoW) at all. To my surprise — YES! It plays perfectly in fact. I get an average of around 22fps (frames per second) while battling monsters. It lowers in high population areas of course (raids would take their toll), but has played perfectly! Some things to take note of, as well as to remind users, is that my netbook was upgraded to 2gb’s of RAM. I also made sure to close most things and I have removed a good bit of bloatware that the netbook came with. Also, the operating system is Windows XP. I am not overclocking whatsoever, though doing so will naturally increase the FPS, but not by too much. I may in the near future try overclocking the graphics card and processor to see how much of an increase will occur though, but only if anyone is interested (comment if you are!). The World of Warcraft settings that were used were a bit higher than the lowest settings, which means that the FPS could raise even further if I decreased some of the graphical effects further. WoW’s resolution was set to 800×600 to help speed things up. Also, I have 3 addons enabled. They’re map addons, but disabling them may also help increase the FPS by a frame…if lucky. Regardless, World of Warcraft runs well. Just thought I’d go ahead and update this article with information on how my personal netbook fairs. It works PERFECTLY still, as if I had just bought it. Proper upkeep is important, hardware and software-wise. On the hardware end I’d recommend cleaning your netbook every once in awhile using canned air (good for keyboard cleaning and so forth) and a microfiber cloth for the screen. To keep the hardware living longer, also make sure to keep the netbook as cool as possible by using a cooling pad. A passive cooling one would work perfectly fine and would require no USB ports to lower battery life. I’ll make sure to post yet more updates as time goes on. I have a feeling this netbook is going to run flawlessly for a very long time. Keep in mind that I HAVE dropped it on several occasions and it has lived with ease. It was the best purchase I’ve made in a very long time. This entry was posted	on Thursday, October 8th, 2009 at 6:55 PM	and is filed under . You can follow any responses to this entry through the RSS 2.0 feed. You can leave a response, or trackback from your own site. is this a SSD drive or a sata drive? if its a sata, whats the rpm? Normal hard drive rated at 5400RPM. all the keys of the keyboard don’t working. I’m not a expert. Device Manager says this device is working properly. Could you please help me about that? Interesting. Did it just stop working randomly? Have you tried plugging in a keyboard to see if that works? Do any of the keyboard-related lights come on — numlock, caps lock, etc? Also, while I don’t have my EEE PC with me right now, I do recall it having a button to turn off the mouse with the FN keys. Maybe a similar one exists for the keyboard?